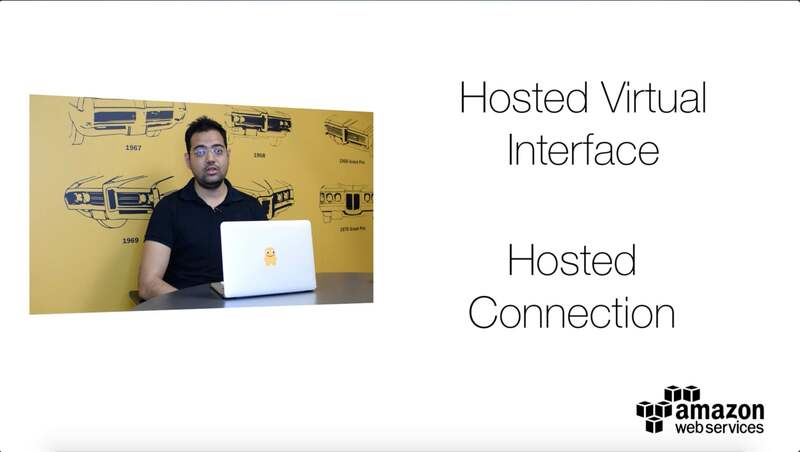 What’s the difference between a hosted virtual interface (VIF) and a hosted connection? I'm not sure if I should use a hosted virtual interface (VIF) or a hosted connection with AWS Direct Connect (DX). How do I choose which type of connection to use? Hosted VIFs can connect to public resources or an Amazon Virtual Private Cloud (Amazon VPC) in the same way as standard VIFs. However, the account that owns the VIF is different from the connection owner. Bandwidth is shared across all VIFs on the parent connection. For instructions on creating a hosted VIF, see Create a Hosted Virtual Interface. Hosted connections allow an APN partner to create a DX sub-1G connection for you. Dedicated bandwidth is allocated for the DX sub-1G connection rather than having multiple VIFs on the same parent connection competing for bandwidth. Contact an APN partner to create the connection, and then complete the steps to accept a hosted connection. Note: You can create only one VIF per hosted DX connection. You can't modify VLAN information to create a new VIF from the AWS Management Console. Each hosted connection is assigned a VLAN on creation by the partner. Each VIF on a given connection requires a unique VLAN tag that can be provisioned only by the partner. To get additional private or public VIFs, request another hosted connection from your APN partner.